Patent blue is the safest and most widely available blue dye for lymphatic mapping during breast cancer and cervical cancer surgeries. This paper reports an anaphylactic reaction to patent blue used for lymphatic mapping during breast cancer surgery where the patient presented with angioedema with bilateral eyelid and upper airway edema. Anesthesiologists should be aware of the possibility of anaphylactic reactions to any drug or substance administered during surgery. When breast cancer metastasizes, it typically spreads to the first lymph node that its cancer cells reach; this node is referred to as the sentinel lymph node (SLN). The National Comprehensive Cancer Network has opined that SLN biopsy (SLNB) is the preferred method for dissection staging of the axillary lymph node in a a breast cancer patient by an experienced surgeon. The SLNB technique has not been internationally standardized, and the methods and materials used for the procedure vary among surgeons and institutions. The SLN can be located using intraparenchymal injection of blue dye, radiocolloid alone, or blue dye plus radiocolloid. Despite its proven benefit for patients, using blue dye for sentinel node mapping can cause severe complications. Patent blue dye (PBD) causes an adverse reaction in 0.9% of cases; symptoms may include erythema, hives, or cardiorespiratory arrest. 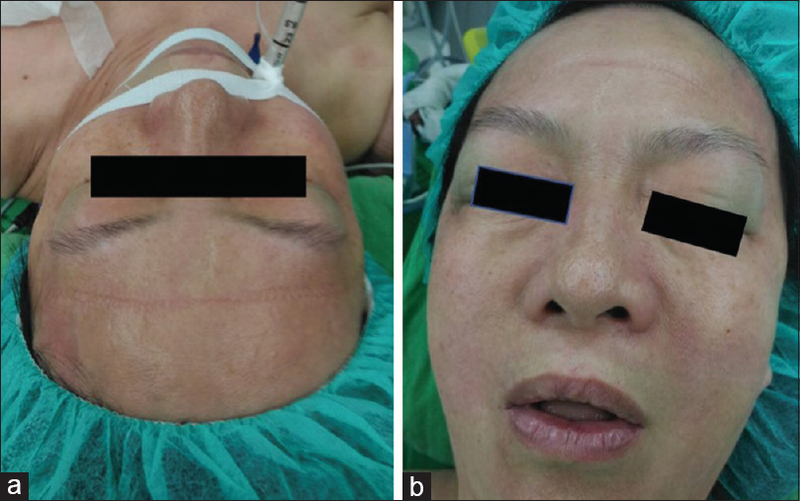 In this paper, we report an unusual case of angioedema where a patient undergoing breast cancer surgery presented with periorbital edema affecting the eyelids and upper airway edema after a PBD injection to map the SLN. We also present a review of published studies on allergic reactions induced by PBD. A 57-year-old woman with a 24-mm hypoechoic lesion in the upper inner quadrant of the left breast and whose pathology showed ductal carcinoma in situ denied having any systemic disease or history of food or drug allergies. After being anesthetized with intravenous propofol (Fresfol 1%) by using Schneider's kinetic model of target controlled infusion (Fresenius Orchestra Primea; Fresenius Kabi AG, Bad Homburg, Germany) composed of propofol Ce 3–4 μg/mL,,,,,,,, fentanyl, rocuronium, dexamethasone 5 mg, and ketorolac 30 mg, no specific skin lesion appeared on the face or anterior chest wall. Tracheal intubation was performed using a cuffed tube with an internal diameter of 6.5 mm and controlled mechanical ventilation with 400-mL tidal volume and a respiratory rate of 10 times/min. At 11:51 am, the 2 mL of 2.5% PBD was injected into the intraparenchymal subareolar region of the left breast. Quadrantectomy and left-side sentinel node dissection were performed. An ill-defined mass approximately 0.6 cm in size was observed in the left breast. The patient's blood pressure, heart rate, oxygen saturation, end-tidal carbon dioxide, and airway pressure were within the normal ranges perioperatively. After surgery, at 12:23 pm, the patient's bilateral upper eyelids were swollen, puffy, and blue [Figure 1]a; an anaphylactic reaction to PBD was suspected. The time interval between the injection and appearance of symptoms of an allergic reaction was approximately 32 min. After extubation, the patient had a persistent cough but normal oxygen saturation. She was transferred to the postanesthetic care unit (PACU), where she exhibited a persistent cough, itching of the throat, mild difficulty breathing, and multiple hives on the face [Figure 1]b. Because of suspected upper airway angioedema, a fiberscope of the larynx was performed, and diffuse edema of the vocal cords and epiglottis were observed [Figure 2], for which 30 mg of histamine-receptor- blocker diphenhydramine and 100 mg of hydrocortisone were prescribed and oxygen was supplied through a face mask. The anaphylactic reaction progressed to the bilateral lower limbs, which exhibited blue-colored urticaria [Figure 3]a and [Figure 3]b. The patient was monitored in the PACU for 2 h. After her symptoms had improved, she was transferred to the ordinary ward. Her symptoms had resolved by the next morning and she was discharged. Lymphatic mapping during breast surgery is a firmly established and minimally invasive technique for predicting a patient's axillary lymph node status. Many techniques have been used for lymphatic mapping, such as blue dye (Isosulfan blue, PBD V, or methylene blue), radiocolloid, or both in combination. Although PBD is regularly used for lymphatic mapping, many reports have described its adverse effects. We performed a comprehensive computer-based literature search, searching the PubMed, Ovid, and Scopus databases for articles in English published up to July 2017, and used the following terms as medical subject headings: “blue dye,” “anaphylaxis,” and “SLN." Anaphylaxis under anesthesia is uncommon, occurring in only 0.01% to 0.02% of patients, and neuromuscular-blocking drugs are the most common drug type related to anaphylaxis. Other causes of anaphylaxis are latex, antibiotics, opioids, nonsteroidal anti-inflammatory drugs, and local anesthetics. Understanding allergic reactions and how they occur during surgery is difficult. Anaphylaxis related to PBD is rare and symptoms include minor reactions such as urticaria, pruritus, erythema, generalized rash, and blue hives. The presence of blue hives is a clear diagnostic criterion of a reaction to PBD. Severe reactions such as bronchial spasms and cardiac arrest are rare.,, In our case, the patient's bilateral upper eyelids were swollen, puffy, and blue; which were the first indications that she had experienced an allergic reaction to PBD rather than shock. The patient also experienced an anaphylactic reaction that occurred in the upper airway and diffuse edema of the vocal cords and epiglottis; based on a careful review and to the best of our knowledge, our case is the first case report of angioedema in the upper airway as a reaction to PBD during breast surgery. The aforementioned case reports have highlighted that rare adverse reactions may occur during general procedures when PBD is used and anesthesiologists and surgeons must be mindful of this possibility to achieve accurate diagnosis and manage any complications. First, surgeons should inform patients that PBD may exert an adverse effect and request written informed consent. However, routine preoperative screening for PBD allergy is unnecessary. Second, if a patient has a history of allergic reaction to blue dye or the surgeon wants to completely avoid PBD-related adverse effects, radiocolloid can be used for an SLNB. The SLN identification rate for radiocolloid is higher than that when only blue dye is used in hospitals where radiotracers are available and staff members are experienced in using the radiocolloid SLNB technique. If a surgeon must use PBD for lymphatic mapping, a preoperative prophylaxis such as glucocorticoid or diphenhydramine is recommended. Preoperative prophylaxis has been found to reduce the severity but not the overall incidence of adverse reactions to blue dye. In our case, we administered 5 mg of dexamethasone, which may have decreased the severity of the adverse reaction. In conclusion, anaphylactic reactions related to PBD are quite rare. Ours was the first case of PBD-induced upper airway edema complicated by mild respiratory distress during breast surgery. Anesthesiologists and surgeons should be aware of the potential for an adverse reaction to PBD when it is used for lymphatic mapping and must possess the ability and have access to the equipment available to perform an emergency resuscitation. Gradishar WJ, Anderson BO, Balassanian R, Blair SL, Burstein HJ, Cyr A, et al. NCCN guidelines insights: Breast cancer, version 1.2017. J Natl Compr Canc Netw 2017;15:433-51. Barthelmes L, Goyal A, Newcombe RG, McNeill F, Mansel RE; NEW START and ALMANAC Study Groups. Adverse reactions to patent blue V dye – The NEW START and ALMANAC experience. Eur J Surg Oncol 2010;36:399-403. Lai HC, Chan SM, Lin BF, Lin TC, Huang GS, Wu ZF. Analysis of anesthesia-controlled operating room time after propofol-based total intravenous anesthesia compared with desflurane anesthesia in gynecologic laparoscopic surgery: A retrospective study. J Med Sci 2015;35:157-61. Lai HC, Chang YH, Huang RC, Hung NK, Lu CH, Chen JH, et al. Efficacy of sevoflurane as an adjuvant to propofol-based total intravenous anesthesia for attenuating secretions in ocular surgery. Medicine (Baltimore) 2017;96:e6729. Lai HC, Tseng WC, Pao SI, Wong CS, Huang RC, Chan WH, et al. Relationship between anesthesia and postoperative endophthalmitis: A retrospective study. Medicine (Baltimore) 2017;96:e6455. Lai HC, Chan SM, Lu CH, Wong CS, Cherng CH, Wu ZF, et al. Planning for operating room efficiency and faster anesthesia wake-up time in open major upper abdominal surgery. Medicine (Baltimore) 2017;96:e6148. Chan WH, Lee MS, Lin C, Wu CC, Lai HC, Chan SM, et al. Comparison of anesthesia-controlled operating room time between propofol-based total intravenous anesthesia and desflurane anesthesia in open colorectal surgery: A retrospective study. PLoS One 2016;11:e0165407. Lai HC, Huang TW, Chang H, Hung NK, Cherng CH, Wu ZF. Nonintubated video-assisted thoracoscopic surgery using regional anesthesia and targeted sedation in a myasthenia gravis patient. J Med Sci 2016;36:168-70. Tseng WC, Lai HC, Chen TW, Wu ZF. Perioperative hemodynamic management of refractory hypotension in a patient with giant hepatic cysts complicated by comp ression of the inferior vena cava: A case report. J Med Sci 2018;38:131-4. Huang NC, Lai HC, Huang YT, Wu ZF. Delayed subcutaneous emphysema in an acute weight loss female following robotic surgery: A case report. J Med Sci 2018; doi:10.4103/jmedsci.jmedsci_6_18(E- Publishing)	. Clarke D, Khonji NI, Mansel RE. Sentinel node biopsy in breast cancer: ALMANAC trial. World J Surg 2001;25:819-22. Aurich S, Seitz AT, Tomm J, Simon JC, Treudler R. A case of anaphylaxis to patent blue in a patient with sentinel lymph node excision. Iran J Allergy Asthma Immunol 2016;15:547-50. Maranhão MV, da Nóbrega DK, Anunciação CE, Maia Bde A, Mariano PV. Allergic reaction to patent blue dye in breast surgery – Case report. Braz J Anesthesiol 2016;66:433-6. Boita M, Mietta S, Bommarito L, Rolla G. Basophil activation test in the diagnosis of patent blue V anaphylaxis. Ann Allergy Asthma Immunol 2015;115:78-9. Viegas LP, Lopes A, Campos-Melo A, Ferreira MB, Barbosa MP. Patent blue anaphylaxis: Case report. J Allergy Clin Immunol Pract 2015;3:112-3. Shyam V, Dossa F, Tanzola RC, Ellis AK, Engen D. Anaphylaxis following patent blue dye in sentinel lymph node mapping. Int J Perioper Ultrasound Appl Technol 2013;2:30-1. Parvaiz MA, Isgar B. Anaphylaxis and blue urticaria associated with patent blue V injection. Anaesthesia 2012;67:1275-6. Joshi M, Hart M, Ahmed F, McPherson S. Adverse reaction; patent blue turning patient blue. BMJ Case Rep 2012;2012. pii: bcr2012007339. Manson AL, Juneja R, Self R, Farquhar-Smith P, Macneill F, Seneviratne SL, et al. Anaphylaxis to patent blue V: A case series. Asia Pac Allergy 2012;2:86-9. Dang Y, Engel J. Patent blue dye and an atypical anaphylactic reaction after sentinel lymph node biopsy in early breast cancer. Breast J 2012;18:91-2. Robinson L. Anaphylaxis to dye during breast surgery. Anaesthesia 2011;66:841-2. Howard JD, Moo V, Sivalingam P. Anaphylaxis and other adverse reactions to blue dyes: A case series. Anaesth Intensive Care 2011;39:287-92. Telgenkamp B, Japink D, van Haaren E. Cardiac arrest after patent blue V injection for sentinel lymph node biopsy in breast cancer. Breast Care (Basel) 2010;5:411-3. Haque RA, Wagner A, Whisken JA, Nasser SM, Ewan PW. Anaphylaxis to patent blue V: A case series and proposed diagnostic protocol. Allergy 2010;65:396-400. Bricou A, Barranger E, Uzan S, Darai E. Anaphylactic shock during the sentinel lymph node procedure for cervical cancer. Gynecol Oncol 2009;114:375-6. Mertes PM, Malinovsky JM, Mouton-Faivre C, Bonnet-Boyer MC, Benhaijoub A, Lavaud F, et al. Anaphylaxis to dyes during the perioperative period: Reports of 14 clinical cases. J Allergy Clin Immunol 2008;122:348-52. Lanitis S, Filippakis G, Sidhu V, Al Mufti R, Lee TH, Hadjiminas DJ, et al. Atypical anaphylactic reaction to patent blue during sentinel lymph node biopsy for breast cancer. Ann R Coll Surg Engl 2008;90:338-9. Thierrin L, Steiger D, Zuber JP, Spertini F, Brunisholz Y, Delaloye JF, et al. Severe anaphylactic shock to patent blue V with cardiac arrest during breast carcinoma surgery with lymphatic mapping. Eur J Obstet Gynecol Reprod Biol 2008;140:140-1. Cohen S, Ad-El D, Erez E, Gutman H. Beware of the blue hives. Dermatol Surg 2008;34:400-2. Keller B, Yawalkar N, Pichler C, Braathen LR, Hunger RE. Hypersensitivity reaction against patent blue during sentinel lymph node removal in three melanoma patients. Am J Surg 2007;193:122-4. Weng PW, Hsu HM, Chen TW, Hsieh CB, Chang TM, Chen VT, et al. Blue angioedema of eyelip after patent blue injection for lymphatic mapping procedure. 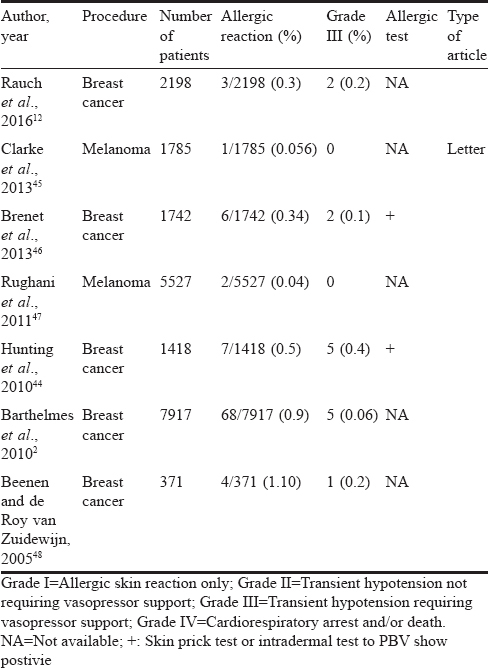 Eur J Cancer Care (Engl) 2007;16:390-1. Mansouri R, Chicken DW, Keshtgar MR. Allergic reactions to patent blue dye. Surg Oncol 2006;15:58. Dewachter P, Mouton-Faivre C, Benhaijoub A, Abel-Decollogne F, Mertes PM. Anaphylactic reaction to patent blue V after sentinel lymph node biopsy. Acta Anaesthesiol Scand 2006;50:245-7.
van Zuuren E, Polderman MC, Kuijken I. Anaphylaxis to patent blue during sentinel lymph node identification. Contact Dermatitis 2005;53:171. Olsha O, Carmon M. Blue hives localized to the opposite arm after patent blue v injection for lymph node mapping in breast cancer. Breast J 2005;11:468. Bouman EA, Songun I, Marcus MA. A case of an anaphylactic reaction to an old substance – Patent blue – For a new indication. Acta Anaesthesiol Scand 2004;48:1066. Ingram D, Hewett L, Maddern P. Anaphylaxis to patent blue during sentinel lymph node biopsy. ANZ J Surg 2004;74:607-8. Wöhrl S, Focke M, Hinterhuber G, Stingl G, Binder M. Near-fatal anaphylaxis to patent blue V. Br J Dermatol 2004;150:1037-8. Forschner K, Kleine-Tebbe A, Zuberbier T, Worm M. Type I sensitization towards patent blue as a cause of anaphylaxis. Allergy 2003;58:457-8. Mullan MH, Deacock SJ, Quiney NF, Kissin MW. Anaphylaxis to patent blue dye during sentinel lymph node biopsy for breast cancer. Eur J Surg Oncol 2001;27:218-9. Woltsche-Kahr I, Komericki P, Kränke B, Brabek E, Horn M, Schuller-Petrovic S, et al. Anaphylactic shock following peritumoral injection of patent blue in sentinel lymph node biopsy procedure. Eur J Surg Oncol 2000;26:313-4. Vrancken Peeters MJ, Boutkan H, Lagaay MB, Agsteribbe MJ, Breslau PJ. Anaphylaxis to patient blue during sentinel node biopsy. Eur J Surg Oncol 2000;26:431. Rauch P, Merlin JL, Leufflen L, Salleron J, Harlé A, Olivier P, et al. Limited effectiveness of patent blue dye in addition to isotope scanning for identification of sentinel lymph nodes: Cross-sectional real-life study in 1024 breast cancer patients. Int J Surg 2016;33(Pt A):177-81. Hunting AS, Nopp A, Johansson SG, Andersen F, Wilhelmsen V, Guttormsen AB, et al. Anaphylaxis to patent blue V. I. Clinical aspects. Allergy 2010;65:117-23. Clarke SA, Molajo A, Powell BW. Incidence of adverse reactions to patent blue dye in melanoma sentinel node biopsy: A major UK centre experience. J Plast Reconstr Aesthet Surg 2013;66:1299-300. Brenet O, Lalourcey L, Queinnec M, Dupoiron D, Jayr C, Rosay H, et al. Hypersensitivity reactions to patent blue V in breast cancer surgery: A prospective multicentre study. Acta Anaesthesiol Scand 2013;57:106-11. Rughani MG, Swan MC, Adams TS, Middleton MR, Cassell OC. Adverse reactions to patent blue v dye used in sentinel lymph node biopsy for melanoma. Eur J Plast Surg 2011;34:201-4. Beenen E, de Roy van Zuidewijn DB. Patients blue on patent blue: An adverse reaction during four sentinel node procedures. Surg Oncol 2005;14:151-4. Mertes PM, Malinovsky JM, Jouffroy L; Working Group of the SFAR and SFA, Aberer W, Terreehorst I, Brockow K, et al. Reducing the risk of anaphylaxis during anesthesia: 2011 updated guidelines for clinical practice. J Investig Allergol Clin Immunol 2011;21:442-53. Niebling MG, Pleijhuis RG, Bastiaannet E, Brouwers AH, van Dam GM, Hoekstra HJ, et al. A systematic review and meta-analyses of sentinel lymph node identification in breast cancer and melanoma, a plea for tracer mapping. Eur J Surg Oncol 2016;42:466-73. Raut CP, Hunt KK, Akins JS, Daley MD, Ross MI, Singletary SE, et al. Incidence of anaphylactoid reactions to isosulfan blue dye during breast carcinoma lymphatic mapping in patients treated with preoperative prophylaxis: Results of a surgical prospective clinical practice protocol. Cancer 2005;104:692-9.